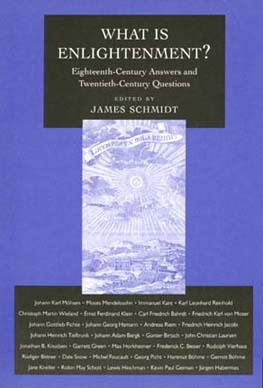 This collection contains the first English translations of a group of important eighteenth-century German essays that address the question, "What is Enlightenment?" The book also includes newly translated and newly written interpretive essays by leading historians and philosophers, which examine the origins of eighteenth-century debate on Enlightenment and explore its significance for the present. In recent years, critics from across the political and philosophical spectrum have condemned the Enlightenment for its complicity with any number of present-day social and cultural maladies. It has rarely been noticed, however, that at the end of the Enlightenment, German thinkers had already begun a scrutiny of their age so wide-ranging that there are few subsequent criticisms that had not been considered by the close of the eighteenth century. Among the concerns these essays address are the importance of freedom of expression, the relationship between faith and reason, and the responsibility of the Enlightenment for revolutions. Included are translations of works by such well-known figures as Immanuel Kant, Moses Mendelssohn, Johann Gottlieb Fichte, and Johann Georg Hamann, as well as essays by thinkers whose work is virtually unknown to American readers. These eighteenth-century texts are set against interpretive essays by such major twentieth-century figures as Max Horkheimer, Jürgen Habermas, and Michel Foucault. James Schmidt is Chair of the Department of Political Science at Boston University. He is author of Maurice Merleau-Ponty: Between Phenomenology and Structuralism (1985).